We've drafted in Greg Wilson, the former electro-funk pioneer, nowadays a leading figure in the global disco/re-edits movement and respected commentator on dance music and popular culture, to bring us four random nuggets of history; highlighting a classic DJ, label, venue and record each month. There have been 2 major points of cross-pollination between Jamaican and black American music. The first was the Jamaican adaptation of US rhythm & blues in the late ‘50s, resulting in ska and leading on to rocksteady, reggae and onwards. After taking in all these influences, Jamaica would repay with interest, providing the seeds for the biggest musical movement of the late 20th century via an ex-pat Kingstonian called Clive Campbell. As a 12 year old in 1967, he rocked up at 1520 Sedgwick Avenue, a high rise building of over 100 units in South Bronx, NYC, which is now recognized as the birthplace of hip-hop. Having been exposed to sound systems as a child in Kingston, he applied this JA approach to the Bronx, but rather than playing the reggae of his homeland, he dished out the dirtiest funk the US had to offer, which perfectly chimed with the urban decay afflicting the black community in cities like New York. Campbell’s strong athletic physique had led to the nickname ‘Hercules’ when he was at school, and he began tagging himself Kool Herc as part of an early ‘70s graffiti crew, the Ex-Vandals. Hosting parties with his sister in the community room at 1520 Sedgwick, he watched how the dancers would go crazy when the drums and percussion came more to the fore, and he focused on these breakdowns, or breaks/breakbeats as they’d come to be known. This was the definitive moment for hip-hop in embryo, and its application, which Herc referred to as ‘the merry-go-round’, involved a quick-fire medley of favourite breaks to thrust the dancers into frenzy. Here lie the roots of breakdancing/b-boying, as hyped-up teens took it down onto the floor. Here also lie the roots of turntablism, and Herc’s innovative manipulation of the breaks would be taken to whole new levels of skill later in the decade by the likes of Grand Wizard Theodore, the inventor of scratching, and the great Grandmaster Flash, hip-hop’s first superstar DJ. As well as local clubs, Herc would take his sound system, dubbed ‘The Herculoids’, outside onto the street and into the park. Echoing a further Jamaican style, that of ‘toasting’, rapper Coke La Rock would vibe up the audience as Herc dropped the tunes – these block parties further enhancing his popularity. 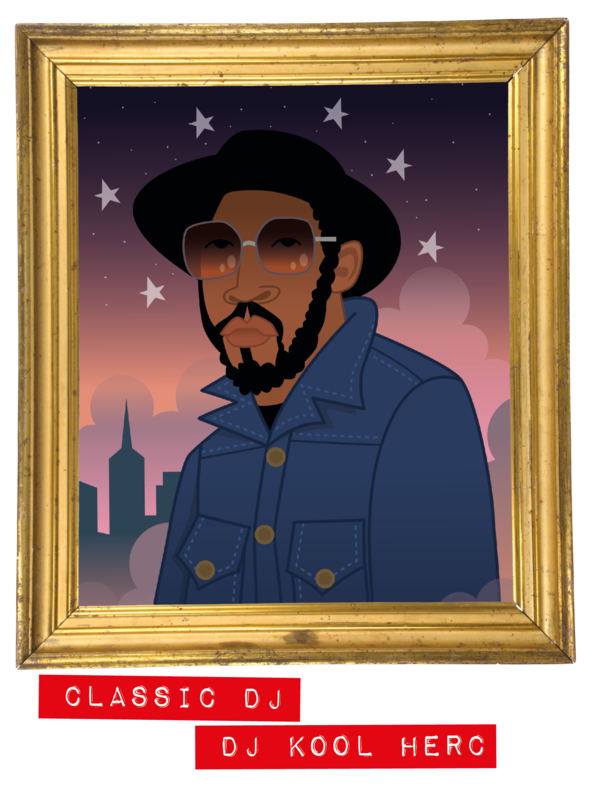 Unlike fellow Bronx pioneers Grandmaster Flash and Afrika Bambaataa, Herc never crossed-over from record playing to record making. As a consequence, his name is largely unfamiliar outside of hip-hop circles, where he’s hallowed as the movement’s founding father. Prelude Records was one of New York’s great underground dance labels, operating between 1976-1986, and releasing music by acts including D Train, Sharon Redd, Musique and Unlimited Touch, as well as the seminal ‘Kiss FM Mastermixes’ – two essential compilations from ‘82 and ‘83, with DJs Shep Pettibone and Tony Humphries providing new versions of tracks recently released by Prelude and others. Founded by Marvin Schlachter, who’d previously run Scepter/Wand Records, and worked for Chess, Janus and Pye - Prelude was born out of the closure of the US division of Pye, a UK company, operating from the same 57th Street offices. 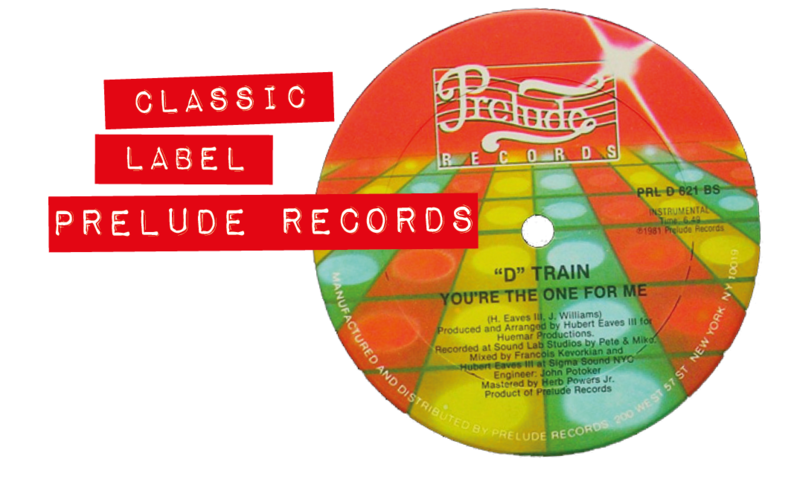 Prelude was one of the disco labels to thrive following the genre’s supposed ‘death’ in 1979. Pivotal in bridging the gap between disco’s 1970s heyday and the late 1980s house music explosion, the label pushed at the boundaries, helping introduce dub elements into club music – the production/mix very much primary to its philosophy. This was crystalized with the arrival of a 24 year-old François Kevorkian, who started working for the company in ‘78, quickly assuming remix duties. His very first attempt resulted in a massive hit via the Patrick Adam’s produced ‘In The Bush’ by Musique. French born Kevorkian (nowadays better known as François K) had moved to the US in 1975, and for a time he worked as a live percussionist alongside one of the great remix revolutionaries, Walter Gibbons, who was then DJing at NY after-hours club, Galaxy 21. In 1977 he taught himself tape editing – it was the perfect preparation for what was to come at Prelude, where he would work for the next 4 years, putting together a series of classic remixes for the label, including D Train’s ‘You’re The One For Me’ and ‘Keep On’, Sharon Redd’s ‘Beat The Street’ and ‘Body Music’ by The Strikers (which he co-mixed with Larry Levan). On leaving the company in 1982 to set up his own studio, Kevorkian would continue to mix some Prelude releases, along with tracks on other labels. Prelude was hugely important for me personally during the early ‘80s electro funk era when, along with other key New York labels including West End, Streetwise, Tommy Boy and Emergency, it would provide an essential part of my playlist. In 2015 I participated in a panel discussion about remix/edit culture at the ICA in London, alongside François, who spoke eloquently about his time at Prelude. When the label closed down, Schlachter sold the catalog to Canadian company Unidisc, who still look after it to this day, recently issuing a large chunk of the labels output digitally via Beatport. 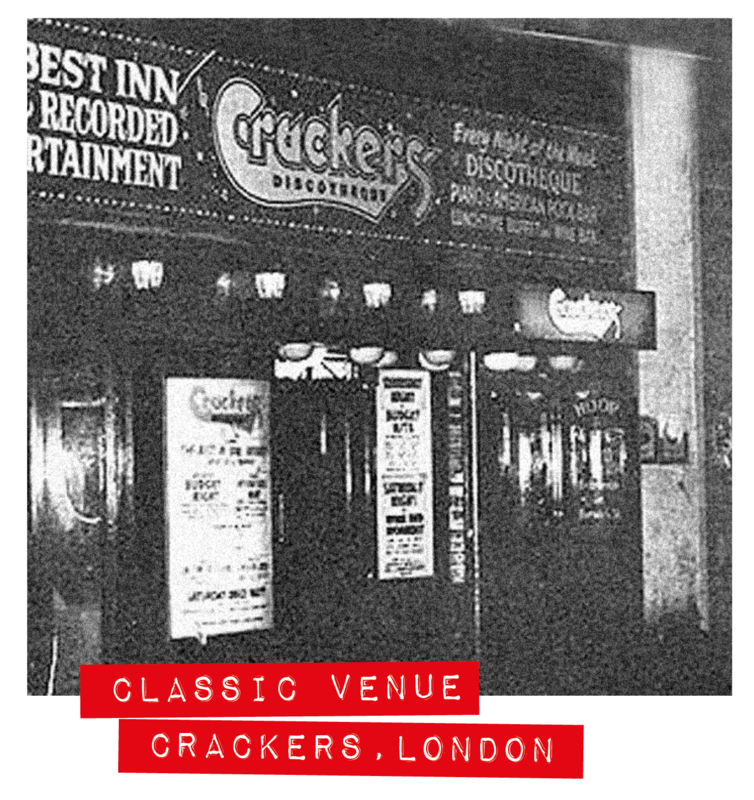 Located on Wardour Street in the heart of Soho, Crackers was arguably London’s leading black music venue of the ‘70s – originally with DJ Mark Roman, then later under the stewardship of George Power. As well as a young Paul ‘Trouble’ Anderson cutting his teeth there, the venue has been cited as an inspiration by DJs including Norman Jay, Jazzie B, Fabio and Terry Farley. Jay recalled the clientele originally being ‘very gay’, although ‘it wasn’t a gay club per se, but it was hip and fashionable’. However, it was a young vital black audience, travelling into the city center from some of London’s toughest areas, who really defined Crackers. From the outside it looked like a typical dodgy dingy nightclub of the time, but inside a musical feast of soul, funk, disco and jazz-funk was served up, whilst some of the best dancers in the capital took to the floor to show off their moves. I was taken to Crackers on a couple of occasions by people I knew who worked in the club promotions departments of the various London-based record companies, all of whom regarded the club as a crucial stop-off. It was a similar vibe to The Timepiece in Liverpool, and how I imagine Rafters in Manchester was around that time, the black kids in the majority and the records featured being the very latest imports fresh from the US. Beginning his six nights per-week residency in 1973, which earned him £63 in total, Mark Roman laid the foundations. The following year, in a throwback to a different era, as well as their regular club nights the venue began hosting a hugely successful Friday afternoon session, and by the summer of ‘76 they were attracting up to 1,000 people, many bunking off school and work in order to attend. Roman left the club in 1976, with his eventual replacement, Greek born George Power, building an even greater legacy than his predecessor – the black crowd more in the majority than ever as the evolving punk scene began to attract many of the white attendees of Roman’s nights. Power would refer to the dancers as ‘boogie boys’ and would frequently use the phrase whilst talking over the microphone, as DJs did back then. The boogie genre, born out of London’s rare grooves era of the mid-‘80s and referring to retrospective disco funk tracks from the late ‘70s/early ‘80s, would appear to stem from Power’s use of the term. Following his tenure at Crackers, ending in 1981, George Power would launch his legendary sessions at Camden’s Electric Ballroom, before going on to co-found London’s Kiss FM radio station. Having gained massive popularity with the British youth during the latter half of the ‘60s - with labels like Tamla Motown, Stax and Atlantic churning out classic after classic - black American music had broken out of the clubs via the Mod scene’s love of soul. However, with the move towards harder-edged funk in the early ‘70s, this new strain of ramped-up dance music was largely ignored by UK radio, and only heard in the more discerning clubs. Across the Atlantic, the disco era had begun to unfold in New York, with DJs like Francis Grasso (Sanctuary), David Mancuso (The Loft) and Nicky Siano (The Gallery) leading the way. However, it was Miami’s TK Records, owned by Bronx-born Henry Stone, which provided one of the key records that confirmed disco’s arrival – George McCrae’s ‘Rock Your Baby’, a single that would sell over 10 million copies worldwide, topping the charts in a multitude of countries, including the US and the UK. The track, as many great ones are, was born out of happenstance. Timmy Thomas, best known for his 1973 single ‘Why Can’t We Live Together’, had been recording at TK’s studios, and had left his Lowry organ there. Richard Finch, of the soon to be famous KC And The Sunshine Band, used the organ’s built in drum machine to create the rhythm and the track began to come together with Harry Wayne Casey (KC) and Finch writing ‘Rock Your Baby’. Gwen McCrae was suggested as vocalist, but it was her husband George who became forever associated with this gorgeously breezy downtempo disco groove, which was voted Rolling Stone Magazine’s song of the year for ‘74. It was issued in the UK on the Jay Boy label, which released much of TK’s output here prior to 1977. 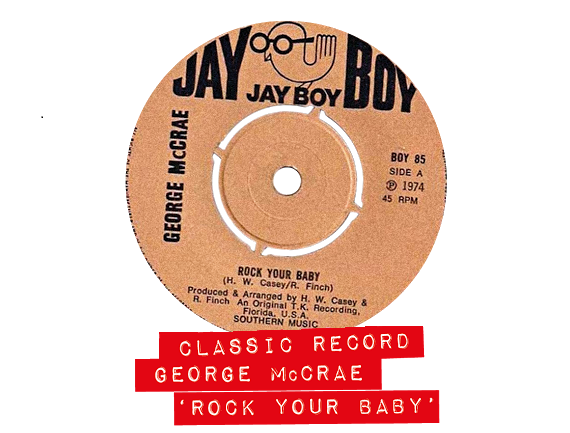 In many respects, the beginning of the disco era in Britain can be dated to July 27th 1974 when ‘Rock Your Baby’ topped the chart, having been a huge club favourite. To put this in context, the last time a black artist had scored a UK number 1 (with the exception of Chuck Berry’s novelty hit, ‘My Ding-A-Ling’ in ‘72) was three years earlier, via a Northern soul re-discovery, originally from ‘64, ‘Hey Girl, Don’t Bother Me’ by The Tams. Remarkably, following on from ‘Rock Your Baby’, two of the next 3 UK number 1s were by black artists whose tracks had gained significant early support in the clubs and discotheques - ‘When Will I See You Again’ by The Three Degrees and ‘Kung Fu Fighting’, a British recording by Carl Douglas, which would subsequently go on to top the US chart.